I rushed into my departure gate at Mumbai airport thinking that boarding would have started, and found that the flight was slightly delayed. That gave me a few minutes to kill in an area with a wonderful art installation. 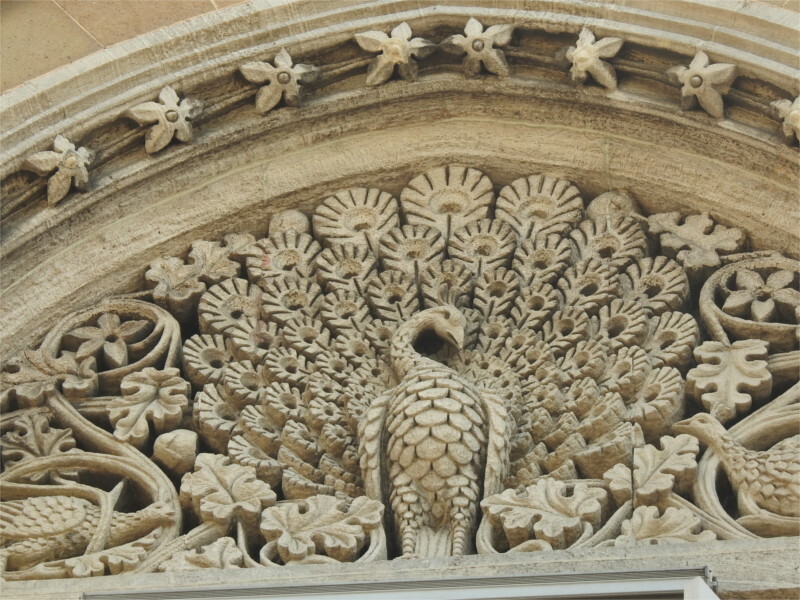 I’ve written about the carved wooden doors of Gujarat sometime earlier, but I had no photos to share. This installation was full of them. 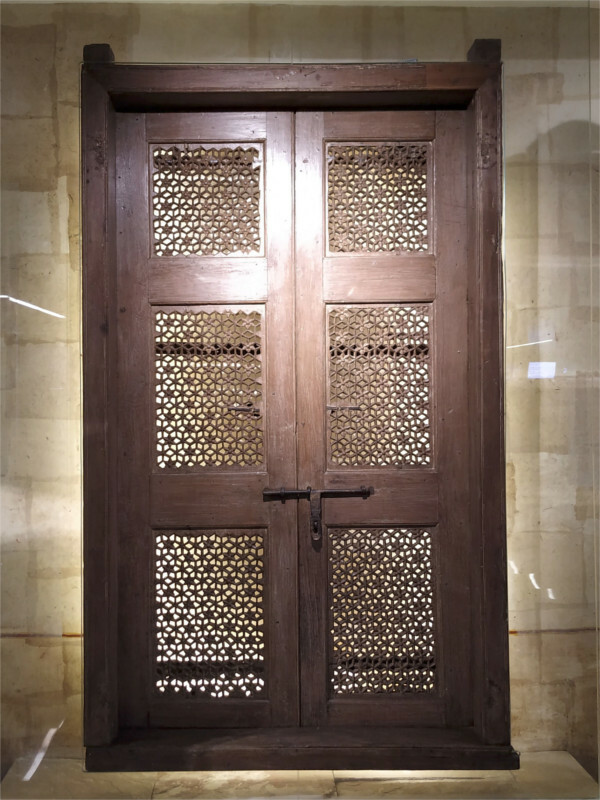 One of the things I like about older localities in Ahmedabad are the exquisitely carved doors of old havelis. 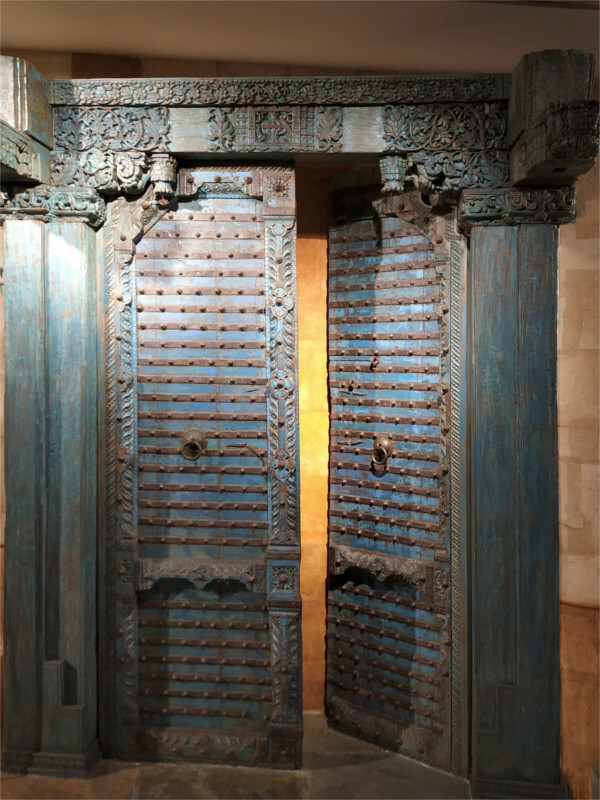 The doors are certainly very attractive, as you can see here, but when you look at the architecture they are embedded in, it is clear that they are there in a supporting role. It is the whole architecture which is the star. Here, in the airport, the doors were extracted out of their settings and shown as beautiful pieces of art. Abstracted from their context, I thought they lost just a bit of life. Used as an art installation they take on a different role, as desirable pieces. Seeing them here reminded me of a conversation I had recently with someone who was thinking of modernizing an old building in Gujarat and getting the money for it by selling the doors and windows of the house. That is a lot of money, which means that there is a market for these doors. Don’t be surprised if one of these old doors turns up in a corporate office you see, or a hotel you walk into. A couple of years ago I was so thrilled by the sight of a vertical garden that I would write a post about each one I saw. Since then this has become so common, that it tells me two things: how strong a need people have to connect to plants and growing things, and how quickly commerce can expand into niches. Two months ago I saw this clever use of a vertical garden while speeding past a construction site in the middle of south Mumbai. “How nice”, The Family said, “beats all the badly painted metal sheets that builders usually put up in places like this.” Then over the last two months I realized that this multimedia installation is now used extensively. Someone has caught on to the idea that it catches eyeballs. I have seen three construction sites which have the same image with a green wall used as the man’s hair. It is still a clever design, and The Family’s amazement is right. Please stand up and introduce yourself if you designed this. Once inside the grand chapiteau I quite enjoyed the music and spectacle, and took many photos with my phone. For a while there was little difference between me and that kid you see next to the stage in the featured photo. 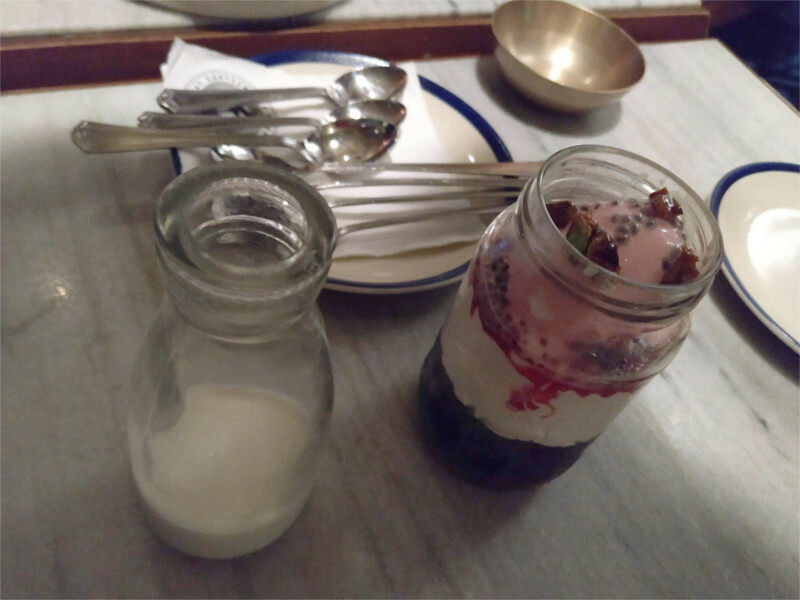 It was only much later that I was surprised by the quality of photos from my dinky little phone. Author I. J. KhanewalaPosted on December 17, 2018 December 17, 2018 Categories Art, IndiaTags Cirque du Soleil, Mumbai7 Comments on Circus? Seriously? We are past the middle of the season of festivals now. Ganesha showed the way at the end of the monsoon. Now Durga is gone for the year. This season is the Indian summer, the muggy period which sets in after the end of the monsoon. The season will end in another couple of weeks, when Diwali swings around again, and signals the beginning of the winter. I took the featured photo at a puja in Powai. I love the sight of people taking selfies in front of the idol. The Family’s Instagram stream was full of such photos. 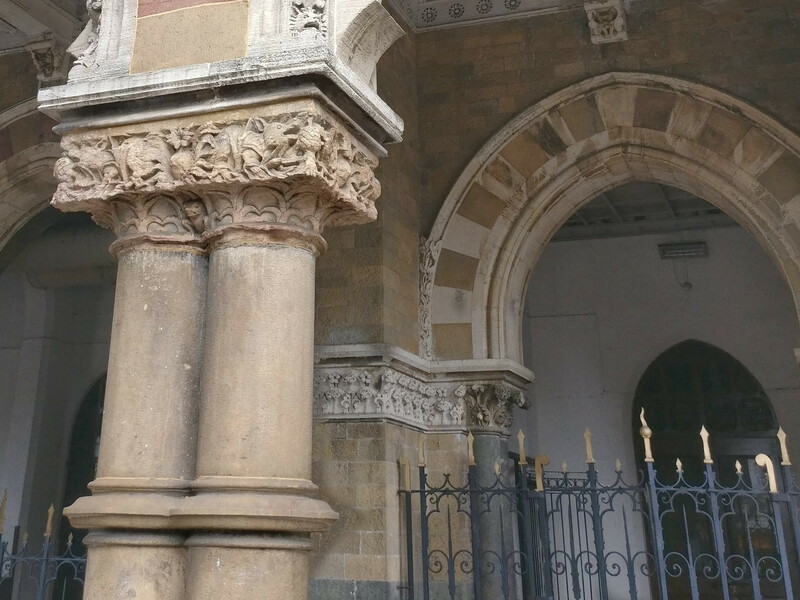 It is hardly possible to walk far in south Mumbai without passing by the Chhatrapati Shivaji Terminus. This example of Victorian Gothic was designed by the architectural firm of F. W. Stevens, and completed in 1888 CE. 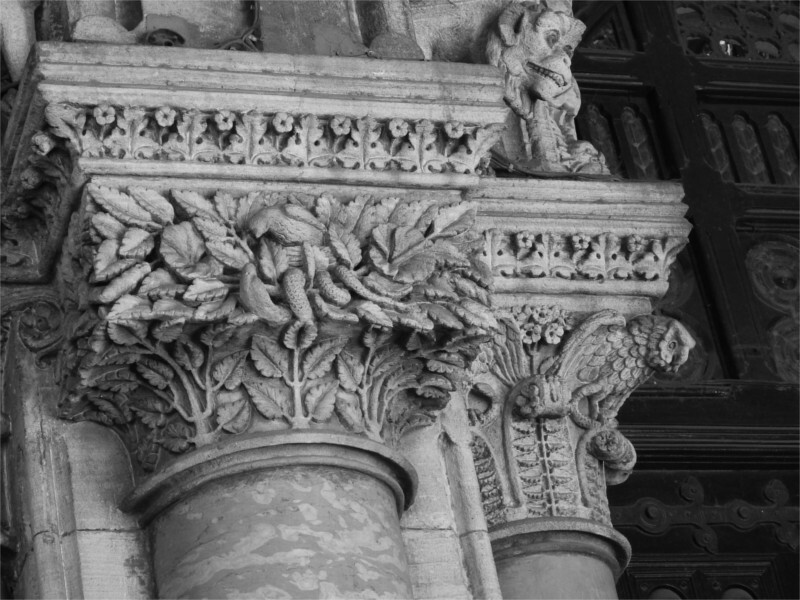 The mosses and algae covering it have been cleared off in recent years, lights installed, and the carvings restored. 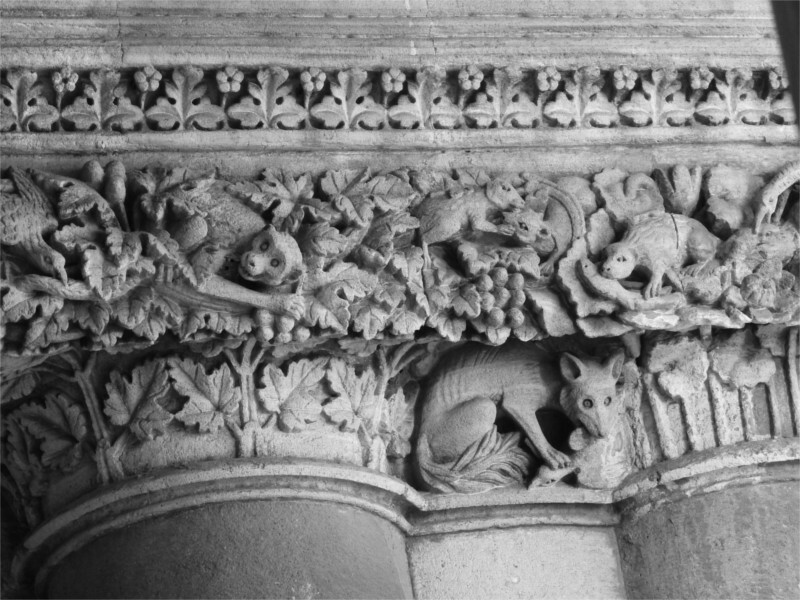 As we walked past, The Family asked “Have you noticed that cat before?” I hadn’t, nor did I recall meeting its unfortunate prey, the rat. 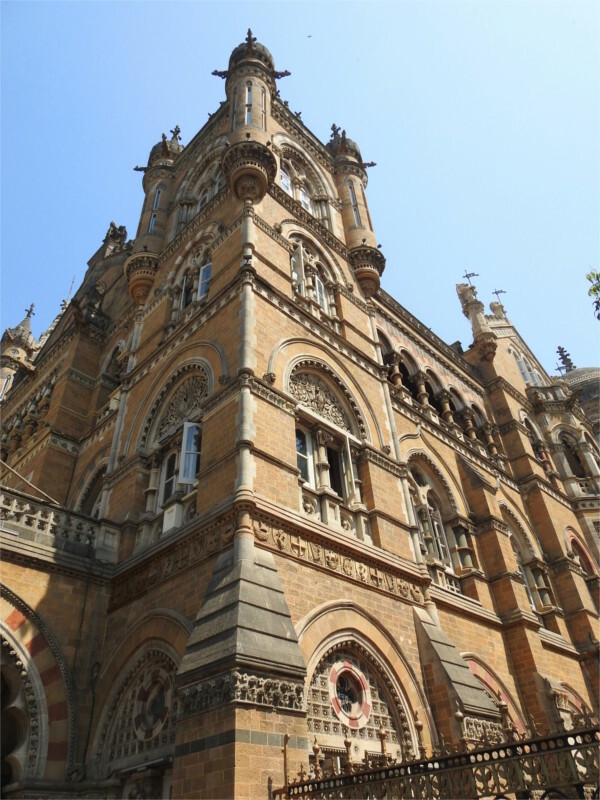 I decided recently that I would walk in most of south Mumbai. Many roads have been dug up for the Metro, which is under construction, and the rest are therefore blocked with traffic, so this is faster. I figured that it would also be healthier to walk. What I didn’t realize is that I would become a tourist in my own town, seeing things which I hadn’t noticed before. The first pleasant surprise was the student murals on the walls of the J. J. School of Arts. 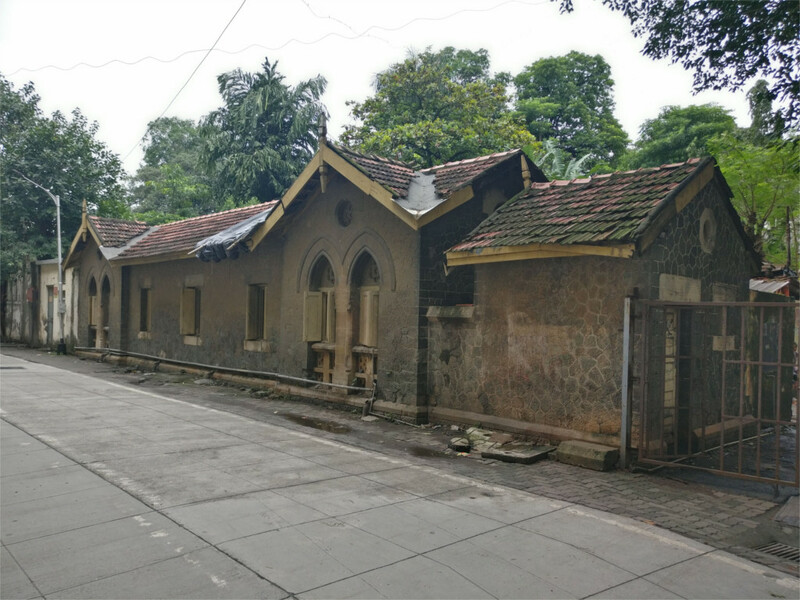 One of the origin stories that Mumbaikars tell each other is that Lockwood Kipling, the father of Rudyard Kipling, taught here. The story is even told in the School’s website. As a result, the Nobel prize winner for literature in 1907 grew up in a walled campus which much of the city commutes part daily. Caught in traffic jams nearby I hadn’t given it a thought. But walking past, my eyes snagged on little things behind the walls. Like the weird pipes around which a artist painted the mural which you see above. Shabby maintenance is also evident in the work which you see above. I liked the work, with the man lying down to admire the wonderful colours around him. But the wall on which it is painted is a picture of awful maintenance. The hole which was punched into the wall to hold an exhaust fan did not account for the shape and size of the fan, and no one bothered to fill in the hole again. That this reduces the efficiency of the fan does not seem to be a concern! This in one of the country’s more popular schools of architecture! 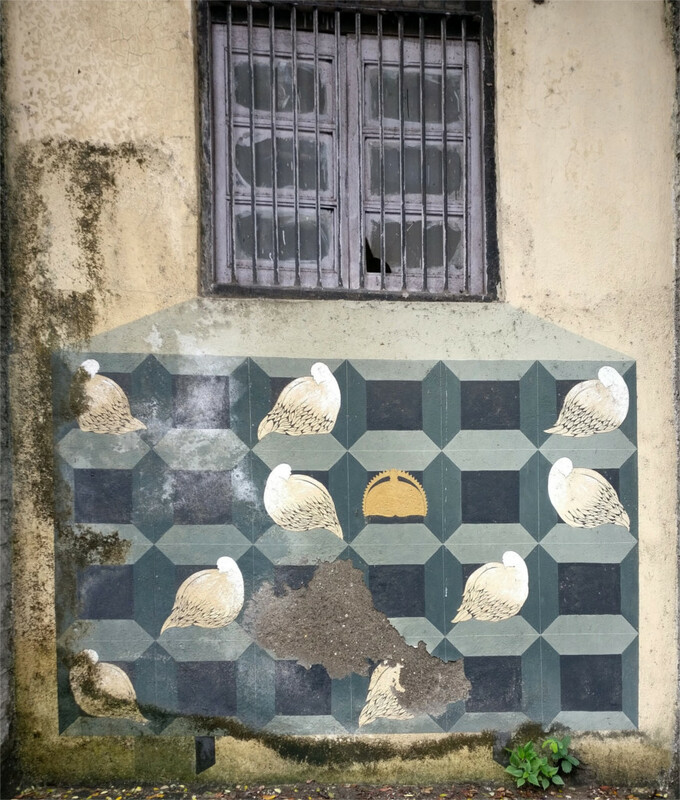 The lovely pattern of pigeons and their coops is a rather clever trompe l’oeil. If the trick fails, it is because the real window is shabbier than the painted coops. The moss growing on the wall is doing a good job to restore the trick; I guess it won’t be long before the painting looks as unlovely as the window. Here is a photo of the remains of a painting that I found interesting. Was this a picture of a lion and an unicorn fighting over a throne? What were the hands doing? I wish more of this was left. The more I walk around town the more I notice how utterly shabby Mumbai is becoming. Zipping across it in a car with windows down you notice only the oases of good repair. Walking, you discover the desert of crumbling buildings. 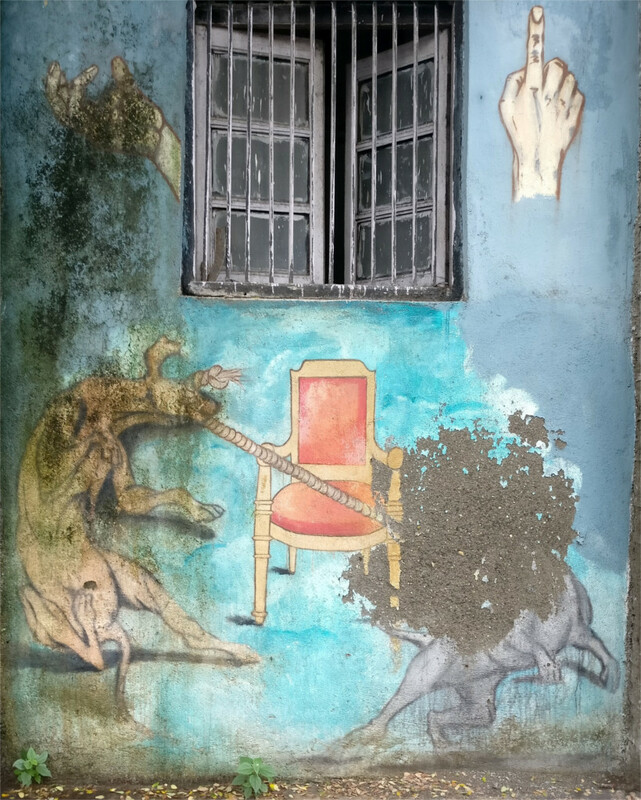 Walking down a fashionable lane in Mumbai, I spotted this striking piece of art on the wall of Nirav Modi’s jewelery shop. The shop shut down because its owner left the country with about USD 2 billion allegedly embezzled from banks. 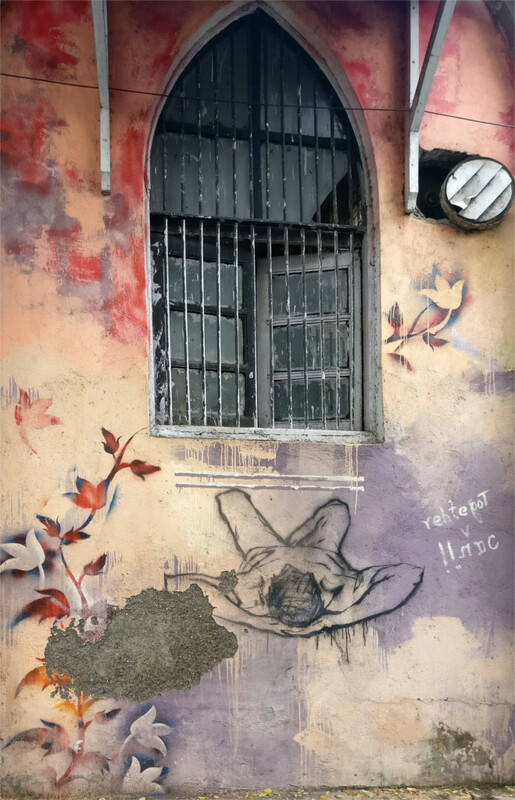 My first guess was that the hashtag at the bottom of this piece of art, “#missingirls”, refers to a well-known snippet from the 2011 census of India. It turned out that in the population of 1.21 million that year there were 940 women to 1000 men. This means that there are about 35 million women missing from India. But I was wrong. This work is part of a campaign by an NGO to raise awareness about the trafficking of young girls. The clever campaign crowd sources the creation of this piece of street art. It was a holiday. Downtown Mumbai was empty. The Family and I walked down a narrow lane where nobody goes any longer except to park their cars. Decades ago there was an open air concert area on the road, very popular for jazz and classical concerts. Then a court order banned open-air concerts within 500 meters of a hospital after 10 in the evening. That was the end of this place. I saw the gates closed. Next to it was a workshop, its shutters pulled down for the day. 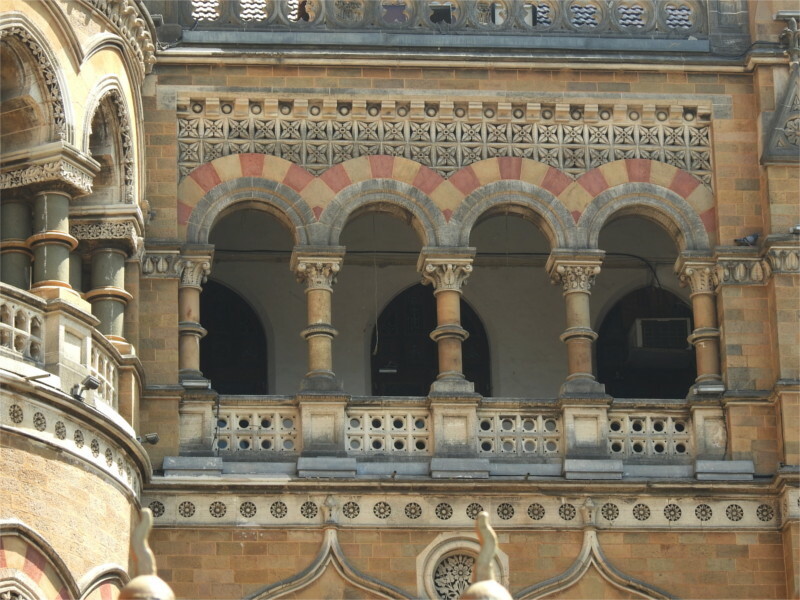 In the usual fashion of buildings in South Mumbai, it looked like it hadn’t been repaired since the Battle of Khadki. 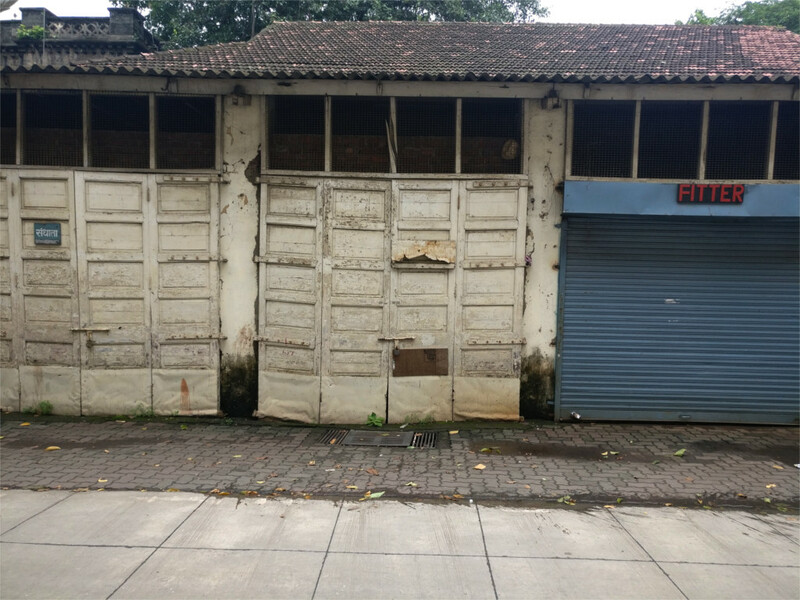 I liked the contrast between the shabby white wooden doors and the blue rolling shutter. 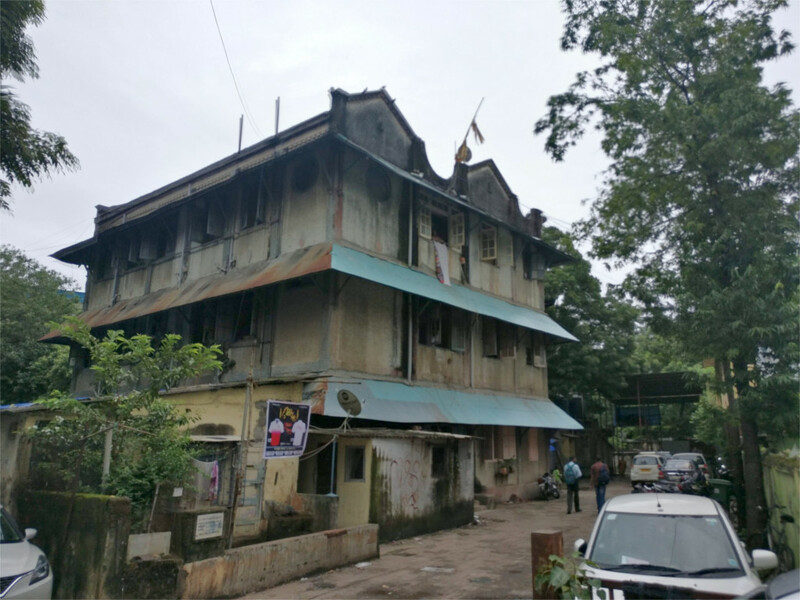 Right across the narrow lane is the back of Mumbai’s most well-known college (featured photo). It was shuttered for the holiday. These shutters were painted, clean, and in good repair. No moss grew on these stone walls. 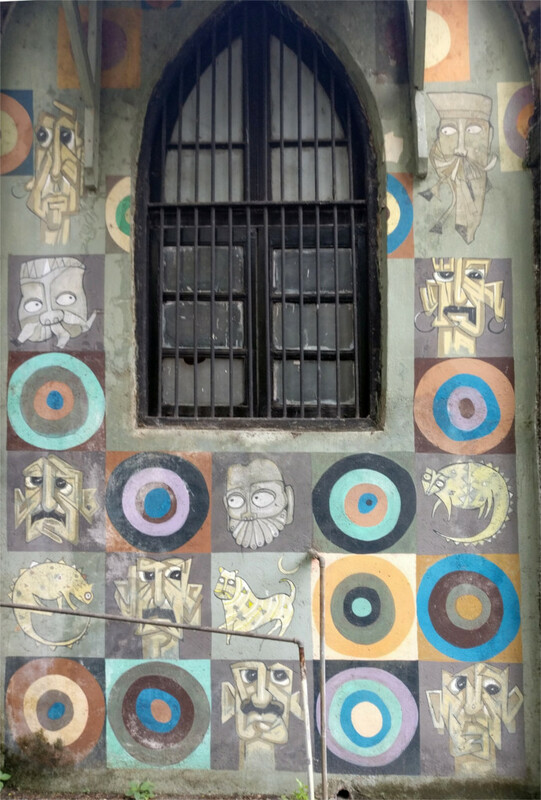 The high walls shut off the fashionable part of Mumbai from the shabby reality around it. A low stone house seemed to hold some municipal offices. It was pretty down; tiles were missing from the roof, the stone walls had not been cleaned. 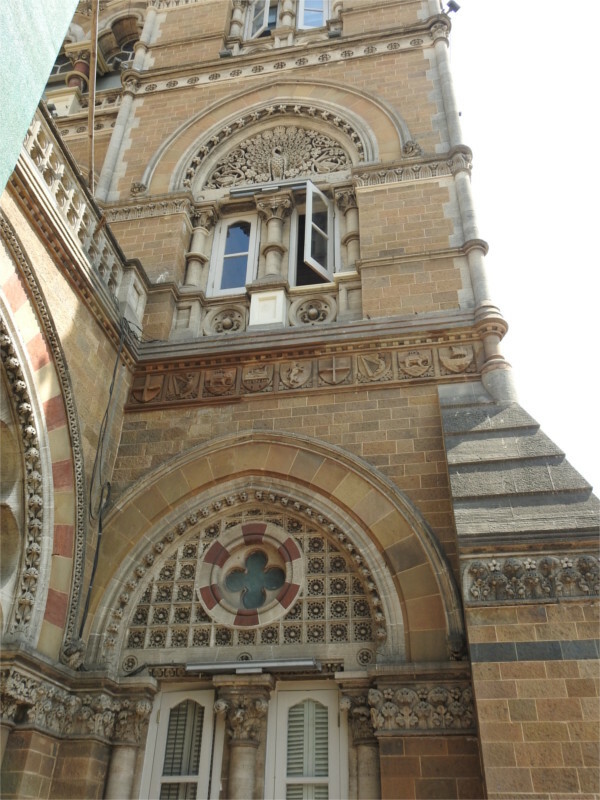 Although the windows were recently painted, they were not in good repair. The municipality does not manage to do a good job with keeping the city in good repair, and this building showed that they cannot even really maintain their own offices. That’s a shame, because this is a charming building. There was a chawl nearby. This was full of life, of people coming and going. I liked the sloping window shades that went right round the building. They broke the boxy shape of the masonry structure, and also harmonized with the sloping roofs. I hadn’t noticed this building before. But then, I had last walked down this lane before smart phones were invented.